The message, which you can see below, signed by Dr. Chungwon Choue himself, refers to the great moment Taekwondo is experiencing right now. 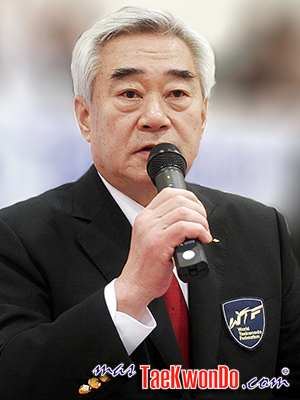 Upon the approval of the IOC Executive Board’s recommendation to keep 25 core sports in the Olympic programme following the IOC Session a few days ago, on behalf of the World Taekwondo Federation and all the taekwondo athletes in the world, I would like to thank you and your national association for all the continued collective efforts you have provided to ensure that our sport remain relevant to sports fans of all generations. Last year, the WTF expanded its membership to 205 nations and territories across all five Olympic continents. This year, the Federation celebrated its 40th anniversary and I sincerely hope that we will continue working together to develop and promote taekwondo and spread the Olympic values around the world for many years to come. Whilst our main objective is to increase the spectators at every competition and Games, taekwondo remains a universal sport with extensive and diverse participation. It offers universal opportunities, regardless of race, gender and social status and the sport is evolving technologically to become more dynamic. These great assets would not be without your dedicated work and again I personally want to congratulate you and your team. I hope we will have the opportunity to meet soon.